Brian Colin created the Rampage video game in the early 1980s and never, ever thought that his creation would become a Hollywood movie starring one of the biggest stars in the whole world. In a new interview, Colin gushes about meeting Dwayne Johnson and reveals that not only does he have cameos in the forthcoming movie, but he's also part of an undiscovered Easter Egg in the original game. Though the Rampage movie is a lot different from the legendary arcade machine, Brian Colin is a very happy man. Brian Colin was able to spend some time on the Atlanta set of Rampage and has several cameos that fans can keep an eye out for, including one scene where he's running away from the giant-sized George. The choice of Colin running from George is actually a reference to a hidden Easter Egg within the Rampage game. When the game first starts, it flashes to three humans who were turned into the giant animals in the game. Colin is George the ape, his wife is Lizzie the lizard, and the game's head programmer, Jeff Nauman, is Ralph the wolf. As far a visiting the set is concerned, Brian Colin was very excited each time that he was able to travel out to the Atlanta set. But visiting the set was nothing compared to getting to meet the star of Rampage, Dwayne "The Rock" Johnson. Colin jokingly compares meeting the superstar to the birth of his children. He explains. "I mean, I hate to say this, but my kids' births used to be at the top of my list of things I'll never forget, but they may have been bumped to second place... (laughs)"
While Brian Colin was on the set of Rampage, he was able to watch the actors from behind the camera. While watching, he was sometimes reminded that he needed to stay out of sight of the actors as not to disturb them, which he completely understood. While meeting Dwayne Johnson for the first time, he said that he was kind of scared that he might have distracted him. He had this to say. "He was saying wonderful things about the game, and I was saying wonderful things about him and the performance and the day I'd spent there. And then he said, But I do gotta say one thing: We're working our butts off here. We are giving everything we've got, and I'm just really working harder on this than anything I've ever worked on. And then I look out and see this guy with a big grin on his face - and I thought, Oh no, he's gonna say that I'm distracted him - but instead he said, and that made it all worthwhile." Colin Brian is a very happy man. Not only did he create one of the most iconic video games of all time, but it's now a Hollywood movie. 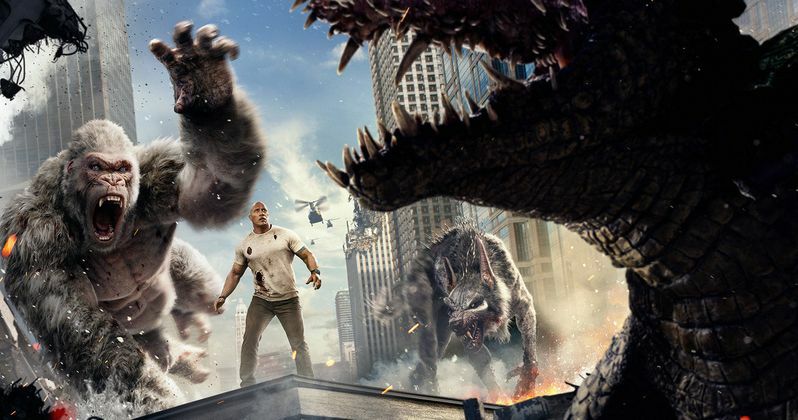 Rampage, a game based on giant animals destroying a city, is now a major motion picture starring Dwayne Johnson. Nobody, not even Brian Colin could have predicted that nearly 40 years ago when he created Rampage. Audiences that have already seen the movie are calling it another big hit for The Rock. You can check out the rest of the interview with Brian Colin over at SyFy.